The Preview Exhibit features a representative piece by each artist in Sierra Art Trails. Viewing the Preview Exhibit is a great way to plan your Art Trails weekend, discover the work that you most want to see, and plan your route to the artist’s studios. The exhibit will be on display from September 7th through October 6th at Stellar Gallery in Oakhurst. The festivities kick-off with a gala reception at Stellar Gallery on Saturday, September 14th from 4 pm to 9 pm. The event is open to the public. 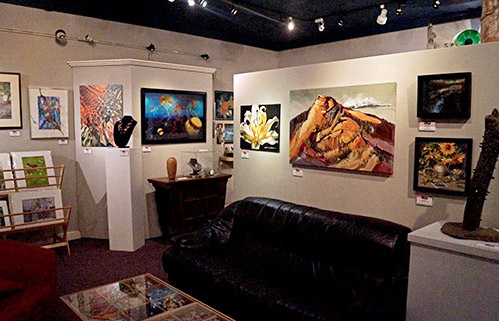 Stellar Gallery is located at Oakhurst’s Gallery Row, 40982 Highway 41, Suite 1, Oakhurst, CA 93644. Gallery hours are 11am to 5pm, Wednesday through Monday. Closed Tuesday. The reception features a pot-luck buffet, kick-off for our annual silent auction, presentation of SAT annual awards, live music, and as always good company and Great Art! Come celebrate the arts, mingle with the artists, and have a rousing good time!